Americans are fairly predictable people. Our lifestyle requires a certainly level of predictability in that we travel back and forth between work and home. We spend our greatest amount of time at home, and if we are wise we try to make our home as secure as possible. After all, this is the one place where we should be able to safely enter Condition White as we sleep. We spend a lot of time at work as well, and while we might not have the same ability to secure our workplace as our home, we can make use of situational awareness, coworkers, friends, familiarity with surroundings and layout, and if we have a private workspace, we also have the ability to place barriers between us and an intruder. Hopefully you have plotted avenues of escape if something threatening occurs as you will have little time to plot such life saving actions while in crisis. Unless you live in a large urban area where mass transit is the primary method of transportation (a whole different threat situation), you likely travel to and from work in your automobile. In some cases, the commute is lengthy, and the time in vehicle can literally be measured in hours instead of minutes. Since our vehicles are ours and we become intimately familiar due to time spent in them, it is easy to fall into a false sense of security while driving. Don't do it! Your vehicle is anything but private; it is surrounded by windows that anyone can see through (think of the things you have seen other drivers do because they thought they were "alone") and you are literally trapped in it by glass, metal and seat belts. If a crisis was thrust upon you, would you know how to quickly extract yourself from your vehicle? Have you ever practiced unlatching your seat belt buckle? Can you do it by feel? How about others in your vehicle? Can you get your children out of their car seats while the vehicle is upside down? I know—you carry a knife for such situations. But have you ever practiced deploying it upside down or while your hands are wet? Can you get it out of your pocket while seated? Have you ever tried to cut a wet seat belt strap? It's tough, and I don't care how sharp your blade is, which is why I like a few serrations on my blade so I can saw through, at least to start the cut. When you rent or borrow a car, do you take time to note how the controls work for seat belts, door locks and window openers? Do you at least take note of where they are so you don't have to try to find them while under attack or after a crash? Most people don't plan to fail; they just fail to plan. Just like you have taken the time to "war game" an intrusion in your home or a crisis in your work place, it is wise to consider what you would do if attacked while in your vehicle. Maybe "attack" is the wrong word (although it can happen); perhaps it should be "crisis" or "conflict" as any number of situations can require a rapid egress from your vehicle. However, this is a gun magazine, thus the central focus will be an attack while in your car, though the necessary mindset can work in any crisis situation. I call this subject "car fighting" as it is succinct and to the point: We are going to fight in and around our vehicle. In the interest of simplicity, we are going to break down such conflict into two areas: inside and outside the vehicle. Inside the vehicle is just that. Someone is attacking you while you are sitting in your car. It could be an attempted carjacking or someone riding with you (don't pick up hitchhikers) turns on you and now you are fighting them off from behind the wheel. Fighting in close confines requires a level of commitment beyond the norm because there is no opportunity to retreat. I once took a class from a champion martial artist who decided he was going to train military and law enforcement personnel in close-combat skills. Throughout the course this instructor kept repeating "this is the type of skill needed to fight in an elevator" as he demonstrated technique after technique that required way too much space. How do I know? Because I have fought a determined assailant in an elevator and have an intimate understanding of what will and will not work when there is little room to maneuver and no place to retreat. I was working in the county jail bringing a serial killer (across several states) to the ground floor to see his attorney. Little did I know this inmate was going to try to use me as a hostage to break out of jail. Fortunately I recognized the threat cues, and when he launched his attack I was ready. Nothing fancy will work in such close confines—no leg sweeps, arm bars, pressure points, joint manipulations or the like. What works when trapped in a closed box is anything that will instantly affect their ability to see and/or breathe. This means rapid, repeated strikes delivered piston-like to the face and neck: a face rack to the eyes; punch to the throat; an eye gouge; or a slap to the ears. These are effective in close confines and will work in a vehicle as well. 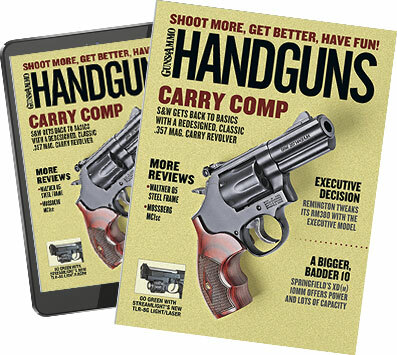 Make no mistake: In the cab of a motor vehicle, open-hand techniques will be required before any handgun can be brought into the fight, so be prepared for fast, vigorous hand-to-hand combat as the fight begins. If time and space can be created by explosive open-hand technique, a handgun can prove to be quite decisive in halting the attack. How fast you can bring your pistol into the fight will depend on where it is located. If it is locked in a storage box or console (as some states require) forget it. The gun will not be a factor in the outcome, so keep fighting. If the gun is in a holster that's readily available, then it will need to be brought into play in such a fashion it is not deflected or taken away. If you can get your seatbelt undone, do so—but do it in such a way it does not trap your arms. I have had great success reaching across my body to hit the seat belt button, though some disagree. My thought behind this is the seat belt is less likely to become entangled in my arms. For example, if I am sitting in the driver's seat and being attacked by either a passenger in the front seat or behind me, I am probably fighting them off with my right hand—thus my left is in a better position to reach over and release the seat belt. If I am in the front passenger seat, the hand used would be just the opposite. If I were in the driver's seat and reached down with my right to release the button, the seat belt could retract and trap my left arm as I turn toward the threat. That will not happen if I release it with my left and then pull it out and away before letting go. If you are wearing your gun on your right side, the area where the gun, seat belt and concealing garment all come together can become quite "busy." You need to practice drawing from a concealed, seated position long before you must sort it out in conflict. Is cross-draw the answer in a vehicle? I don't know. Is it your regular mode of carry? Can you remember two draw locations in conflict? Only you can decide this. What I do know is this can be practiced through dry-firing; remember to do so with your upper torso turned in multiple directions. Practice with the gun pointing in these directions, noting where you need to hold the gun so your opponent won't be able to grab it. And he will be trying to do so. None of these positions will resemble what you practice on the range, and you might have to shoot through the seat with the gun oriented upside down, depending on where your attacker is once you start shooting. Shoot until the threat stops. This is no time to shoot two rounds and evaluate. Your attacker decides when the fight is over, and all you can do is help him arrive at that decision. A fight inside your vehicle needs to be over quickly and decisively—a few seconds at best. It is not a time to dither because you will tire quickly. A threat that comes from outside the vehicle offers additional options. First and foremost, if the vehicle is not disabled, drive away. The front end of any motor vehicle offers far more foot-pounds of stopping power energy than any small-arm projectile. If you need to shoot through the windows do so. Keep in mind the side windows will respond differently than the rear window or windshield when struck. The side windows are designed to fragment on impact so flying glass is less likely to injure occupants in a crash. When shot, the window glass will break up and fall. The windshield is designed to stay intact so the driver and front passenger are not decapitated on impact. When the windshield is shot, the rounds will punch through the safety glass—making a hole and cracking same. Trajectory deflection on close targets is minor, so aim as you normally would. Something to keep in mind is the glass shards that are produced by rounds entering the vehicle through the windows will fill the interior, fouling vision and cutting flesh. If the car will not move, then you need to get away from it because it offers very little true cover. What about the engine block? While it is a solid piece of metal, it is not very wide or tall and requires close proximity to get behind—making it an easy position to shoot over or flank. However, it is a good place to take refuge while you chart your escape. If you can determine which direction the incoming fire is coming from, exit the vehicle to the opposite side. Try to make yourself as small as possible while doing so. While the doors offer little cover, it is harder to zero in on you if you cannot be clearly seen, so get down. That said, if doing so slows your escape considerably, it might be smarter to just move. As you fling the door open to make your escape, take a moment to stabilize it so the spring action of the door does not reclose it on an arm, leg or other body part—causing serious injury just when you need to be mobile. Once out of the car, stay low and look through the windows to see if you can identify the threat. While windows are not cover, they might help mask your head coming up over the edge of the body, unlike trying to look over the trunk or hood. Move away from the vehicle in a quick, zigzag fashion, getting to the nearest piece of cover or concealment. Keep in mind very little in our society is true cover from a .30 caliber rifle so keep moving until you are truly out of the kill zone. Distance will always be your friend. No article can truly cover everything you need to know about car fighting. If nothing else, I hope I have given you food for thought on how to make yourself a harder target when traveling in your motor vehicle. We all like our cars, and while it is certainly okay to feel comfortable while in them, we should never feel completely secure. When in your car, use your windows and mirrors to check your 360 often!